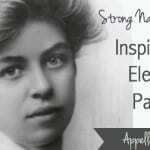 Let”s celebrate women’s history month with suffragette names. These names belong to women who dared to change the world. They may feel sweetly vintage, but they convey strength and fearlessness, too. The name comes from the Latin suffragium – right of voting. Suffrage appears in the U.S. Constitution. Suffragist once referred to any one involved with expanding voting rights. Back to the names. Since the movement dates to the late nineteenth and early twentieth centuries, the activists’ names all count as vintage gems today. They don’t scream suffragette – though many of their famous bearers will quickly come to mind. 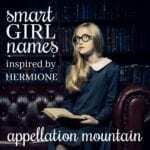 Instead, these names make enduring choices with worthy namesakes. Ada – Most of the suffragettes were educated, middle class women. Ada Nield Chew was the exception. She left school at a young age to help run the family farm. Later in life, Chew founded a business, traveled the world, and became an activist. 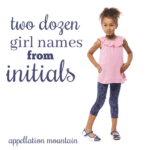 Adela – We love Addie names, but Adela remains outside of the US Top 1000. Adela Pankhurst was the daughter of founding suffragette Emmeline. She helped establish the women’s suffrage movement in Australia. Agnes – Agnes Maude Roydon earned a Doctor of Divinity in 1931 and advocated for the ordination of women. One challenge: Roydon much preferred – and almost exclusively used – her middle, Maude. Still, Agnes remains an underused gem with plenty of strength and vintage appeal. Alice – Alice Paul spearheaded the campaign to pass the 19th Amendment. She then spent another fifty years working on reform, including the 1964 Civil Rights Act. Australian journalist and reformer Alice Henry also bears the name. Amelia – Years before pioneering aviator Amelia Earhart took to the skies, Amelia Bloomer edited The Lily, an early newspaper for women. She advocated women don trousers, so famously that the pants bore her name – bloomers. Angelina – You might think Jolie, but centuries earlier there was Angelina Grimké. With her sister Sarah, they campaigned for abolition and women’s rights. Cady – Lindsay Lohan answered to Cady in 2004’s Mean Girls. It brings to mind Elizabeth Cady Stanton, one of the leading forces behind the women’s movement in the US during the 1840s. Christabel – Another of Emmeline Pankhurst’s daughters, Christabel started out in the suffrage movement. She later became active in American religion. Clemence – Novelist Clemence Houseman and her brothers were active in women’s suffrage. Constance – Lady Constance Bulwer-Lytton was born the daughter of an Earl. She turned her back on privilege to become a crusading suffragette, enduring prison and hunger strikes. Dora – Activist Dora Marsden was given to bold acts and an especially revolutionary view of society. Edith – At least four notable Ediths were involved with the women’s suffrage movement. Edith Cowan became the first woman elected to Australia’s Parliament. Self-defense instructor Edith Garrud learned jujitsu and taught classes to her fellow suffragettes. Physician Edith Pechey was among the first female doctors. And Edith Rigby founded a school for working class girls. Emma – Emma Willard devoted her life’s work to women’s education. The private school she established in Troy, New York, now bears her name. Emmeline – Emmeline Pankhurst was the grand dame of the Women’s Social and Political Union, and among the most famous and influential of activists. Esther – The daughter of a factory worker, Esther Roper graduated from Owens College, now the University of Manchester, and became a talented organizer. Gertrude – Gertrude Foster Brown advocated for the vote, and then authored Your Vote and How to Use It for a generation of newly-enfranchised women. Ida – Ida B. Wells was active in civil rights and women’s suffrage, an African-American journalist in a dangerous age. Wells reported on lynching, and is considered one of the founders of the NAACP. Irene – Canada’s Famous Five challenged their country’s Supreme Court in the 1920s. Irene Parlby was among the quintet, all seeking Senate appointments. Inez – Inez Milholland was suspended from Vassar for organizing a suffrage meeting. She later played a key role in organizing the 1913 Woman Suffrage Procession. A devoted activist, she also become a labor lawyer, and served as a war correspondent during the first World War. Isala – The first Belgian woman to graduate from medical school was Isala Van Diest, educated in Switzerland and admitted to practice only after a royal decree made it so. Jane – Several Janes could make this list, but Jane Addams is the best known. Remembered as the mother of social work and an ardent reformer, suffrage was one of the many causes she championed. Josephine – Josephine Henry was a writer and candidate for state-wide office in Kentucky. On the other side of the ocean, Josephine Butler advocated for women’s rights, and was especially concerned with the plight of poor women. Katharine – Hollywood icon Katharine Hepburn shared her name with her mom. The elder Katharine was a leader of the American suffrage movement. Leonora – Leonora Cohen was a close associate of Emmeline Pankhurst, best known for smashing the display case for the British Crown Jewels in the Tower of London as a protest. Louisa – The niece of activist Millicent Fawcett and daughter of Elizabeth Garrett Anderson, Louisa Anderson followed in their footsteps. Like her mother, she became a physician and chief surgeon of the Women’s Hospital Corps during the first world war. Lucretia – Quaker activist Lucretia Mott helped co-found Swarthmore College. Lucy – Lucy Stone earned a college degree back in 1847, when such a feat was rare for women. She advocated for women’s ability to keep their birth names at marriage and did so herself. Years after her death, the Lucy Stone League was established to fight for women’s rights to do the same; members were called Lucy Stoners. Lydia – A widow, wealthy landowner, and mother to an underage son, Lydia Taft became the first women in colonial America to legally vote. Perhaps it’s a stretch to call her an activist – and she voted as “the widow Josiah Taft” – but it feels like she holds a special place in history. Many years later, English scientist and astronomer Lydia Becker published the Women’s Suffrage Journal in the UK in the late nineteenth century. Mabel – Born into a suffragette family, Mabel Capper became an activist in her own right. Madeleine – Madeleine Pelletier was among the first French female psychiatrists. She pushed for women to be accepted into more medical fields. She became a polarizing figure, known for adopting traditionally masculine dress. Pelletier also traveled illegally to the Soviet Union. Mathilde – In Denmark, the Danish Women’s Society awards the Mathilde Prize to a writer who advances the ideals of equality. The prize is given in honor of Mathilde Fibiger, a mid-nineteenth century author known for her work advocating women’s rights. Marguerite – Actor-turned-writer Marguerite Durand was a stylish member of Parisian society at the turn of the century. Durand dressed stylishly, kept a pet tiger, and advocated for many women’s causes. Maud – There’s Maude Roydon, but also Maud Wood Park. Park campaigned for the nineteenth amendment on college campuses. May – May Preston Slosson was the first woman in the US to earn a PhD in philosophy. She graduated from Cornell and spent many years in Wyoming, where women’s rights came much sooner. When she returned with her family to the East Coast, she became active in the suffrage movement. Millicent – Millicent Fawcett worked to advance women’s educational opportunities. Minnie – Minnie Fisher Cunningham advocated for the passage of the nineteenth amendment, persuading President Woodrow Wilson to release a pro-suffrage statement. Years later, Cunningham ran for Governor of Texas, though she lost to the incumbent. Olive – Need another reason to love Olive? British activist Olive Wharry smashed windows and committed arson to make her point. Olympia – Considered the first American woman to serve as a full-time ordained minister, Olympia Brown’s career spanned two generations of suffrage. Richmal – We remember Richmal Crompton for her Just William children’s books. While her suffrage work was limited to her college years, her name is too good to omit. Sadie – Sadie L. Adams became one of the first women to serve on a Chicago election board. She also co-founded a number of women’s voting groups, and was active in the Alpha Suffrage Club, a leading African-American suffrage organization. Sojourner – We think of Sojourner Truth as an abolitionist. The former slave’s immortal “Ain’t I a Woman?” speech puts her on this list, too. The version you know is almost certainly wrong. Truth was born in New York, not the American South, and her first language was Dutch. Early accounts give a very different version of her speech. Sophonisba – Social reformer Sophonisba Breckenridge earned a PhD in political science from the University of Chicago, and became the first woman to represent the US government at an international conference in 1933. Susan – She’s the face of the American suffrage movement. Along with Elizabeth Cady Stanton, Susan B. Anthony remains one of the best known activists in the US, even appearing on a coin. Sylvia – Another of Emmeline Pankhurst’s daughters, Sylvia moved from suffrage to anti-war demonstrations. Tennessee – Born Tennessee Celeste Claflin, Tennie and her suffragette sister became the first women to operate a Wal Street brokerage firm. She also led a delegation of women to the US Senate to demand the vote. Victoria – Sister to Tennessee, Victoria California Calflin Woodhull became the first female candidate for President of the United States. Vida – An Australian activist, Vida Goldstein was introduced to the cause by her mother. She’d later become active in pacifism and other movements, too. Winifred – Winifred Carney became a leading Irish activist. She was the only woman present during the initial phase of 1916’s Easter Uprising. First published on March 15, 2013, this post was revised and expanded on March 7, 2019. Great list! Are there any names that could be used for boys? Abby, thank you so much for mentioning Sojourner Truth and her speech ‘Aren’t I a Woman.’ Nell Irvin Painter points out the facts about the speech as you have briefly stated. It is painful to read about a woman whose words and very presence was manipulated by abolitionists and feminists to further their own causes and needs. Great list. I’d add Vera Wentworth. 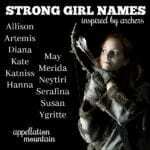 I adore so many of these names, but I LOVE Ada. In fact, I immediately added it to the top of my list of names for an imaginary daughter that I’m not planning on having. If I ever change my mind, I’m all set to go with Ada Eleanor! It would be a great namesake for both Ada Nield Chew and Ada Lovelace. This was my understanding too–in the U.S., the term “suffragist” was still preferred and “suffragette” was used mockingly. I just read an article about Inez Milholland. One of her more notable appearances was riding a white horse in a suffrage parade she organized in Washington DC. A few years later, at the age of 30, she collapsed during a speech she was giving and apparently her last public words were, “Mr. President, how long must women wait for liberty.” Interestingly, her widower married another notable woman Edna St. Vincent Millay. While I’m not sure I would ever use the name Inez, I kind of adore it. It has style and I’m surprised it hasn’t made a comeback with all of the other vintage names. There are only a few that I dislike. I also saw an interpretation later that derives the meaning of the tribes name from Salt. Fascinating – thank you, Huckleberry! Fabulous list and women! Katharine has long been my favorite spelling of the name. One of the many and varied reasons I love Elizabeth is my admiration of Elizabeth Cady Stanton. This is a great list! Emma Willard could have been included too. A popular name that has some backbone when you look at Willard’s life and work. I’m in love with Acadia with the nickname “Cady” in honor of Elizabeth Cady Stanton. 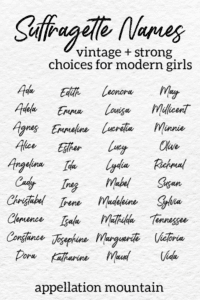 So many great women and names! Would you consider doing Acadia as a name of the day? Love Winifred Banks (Glynis Johns)! Given that the movement spans from 1848 – 1920, there are a lot of names that could be included, especially those who were more active as abolitionists first. Great list! I really love this list. Thanks for sharing!